EWTN presents the teachings of the Catholic Church in an easy-to-use format. Catholic topics presented here are structured in a hierarchy of learning, from simple definitions and teachings to more detailed and involved. We encourage you to begin with the basics to become well grounded in Church teaching on a variety of subjects. As your understanding of a particular topic becomes more familiar, move on to the more in-depth study of each topic to round out your learning. The BIBLE is a written message from the living GOD to all people. He inspired it’s authors to communicate His plan of redemption and salvation for people of all time. St. John wrote in 90-100 A.D. for the Church in general. Pope Damasus around 499 A.D. unified the New Testament into 27 Books. The Bible was translated from the Hebrew. The Old Testament contains 46 books. We should make it a daily practice of reading the Bible for spiritual insight of our souls. ALWAYS remember that the Bible came out of the Church, the Church did not come out of the Bible. It was written so that the teaching of Christ would be available after the Apostles died. Where did the Bible come from? 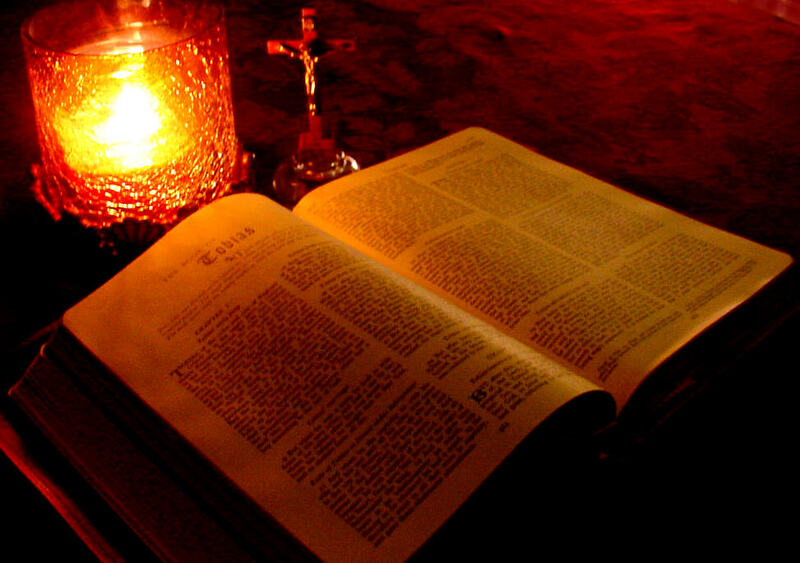 The satisfying part about the history of the Bible, is that it is purely Catholic. The Bible is the inspired and inerrant Word of God. All Christian faiths teach these two points. But many Catholics and most Protestants do not know that the Bible has always had 73 books, not the 66 books that the Protestants recognize. We know this because in the very early years of the Church, there was no Bible. Instead, there was only oral tradition and scrolls of scripture used in the Jewish faith, supplemented by the occasional letter or writing. But since most of the world was illiterate, oral tradition was the primary means of evangelization and catechesis for the first Christians. Some of the apostles and early disciples recognized that it was going to be important to write this down in case Christ did not return during their lifetime or within the following generation. Remember that St. Paul and many others believed that Jesus was going to return during their lifetime or soon thereafter. Paul actually had to rebuke those who believed Christ’s return was imminent and stopped working and providing for themselves. So within a decade or two after Christ’s resurrection, people started writing stories and accounts about Jesus and his apostles. After the apostles were all martyred or dead (tradition tells us that St. John the Evangelist was the only apostle to die of natural causes), the early Church fathers began to sort through the writings that had been in use in the early Church. They quickly identified that some were much more accurate and reliable than others. A discussion regarding the authentic works of the apostles or the immediate disciples of the apostles persisted until the fathers arrived at the most important books in the 200’s. But the Bible was not identified quite yet. A large portion of the Bible was already in existence by the time of Mary’s Fiat. This portion of the Bible which was in existence in apostolic times is now known as the Old Testament. The problem was, different sects of Jews used slightly different lists of books of the Old Testament. Therefore, different Jews recognized different writings as the inspired and inerrant Word of God, even in apostolic times. This continued through the first few centuries of the early Church. In about 250 A.D., Origen became the first known person to list the same 27 books of the New Testament that we use today. But other than Origen (who is considered a Church Father), the Church was yet to make a formal declaration. There was still uncertainty about which books belonged in the Old Testament. This was important to the early Christians because they desired to be one Church, unified in doctrine and in practice, as Christ had commanded. Therefore, they needed to agree on which books could be used in celebrating Mass, other liturgical practices and in teaching the faith. Pope Damasus, understanding the concerns of differing sources, wished to correct this by having a “common” translation. To assist in this he called upon St. Jerome, who had shown his expertise in languages at a recent synod. This was not expected to be as large of a project as it eventually became: Damasus asked Jerome to revise the Old Vulgate only for four Gospels. Jerome began this process in A.D. 382, and was able to complete it in about two years, using many original Greek manuscripts, and comparing these to the Old Vulgate versions that existed. He did not give us a new translation, but about the year 383 revised the then current Latin text in accordance with some Greek MSS. Latin being a dead language would not continue to evolve like all other languages. In 1546, the Council of Trent finally gave the Vulgate official approval. But it did not exclude the possibilities of other editions. In 367 A.D. St. Athanasius set forth the very first list of the books that were considered inspired and inerrant. 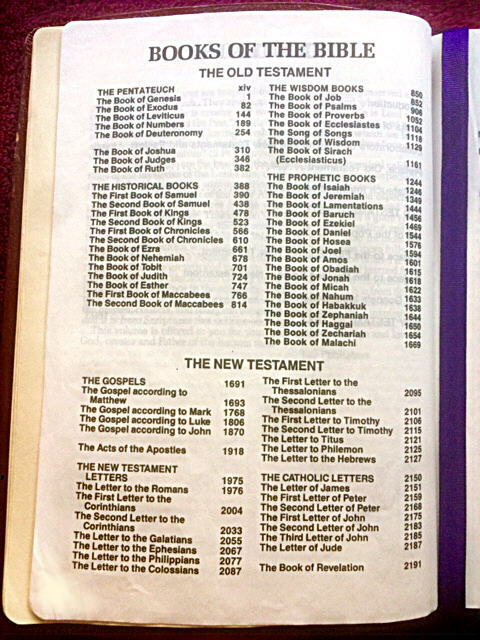 He listed 73 books and if you look at the index of your Catholic Bible today, you will see the exact same books that St. Athanasius listed over 1,600 years ago. However, the Church had not yet formally declared any books as inerrant or inspired. This happened for the first time 15 years later, at the Council of Rome (382 A.D.), again in A.D. 393 at the Council of Hippo, later at the Council of Carthage in 397 and 419 A.D. and several other times in history. Each time, the 73 books listed by St. Athanasius were officially accepted and ratified by the Catholic Church. Keep in mind that no other Christian church existed during this entire time. For over 1,500 years, Christians were either Catholic or they were not a follower of Christ. All Christians accepted the 73 books established by the Catholic Church until the year 1536, when Martin Luther published the Old Testament in the German language. This was the first time a Bible was published with fewer books than St. Athanasius had listed in 367 A.D. (1,169 years earlier). Why fewer books? Luther had to find a basis for his version of theology. He could not support many of his new beliefs with a Bible that contained all 73 books. In fact, he couldn’t even defend his beliefs with the 66 book Bible either, but what he lacked in proof, he made up for with tenacity. He deeply desired to remove several books form the New Testament as well, but in the end, he was satisfied with removing 7 books from the Old Testament as well as parts of Daniel and Esther. As Catholics, we need to have a better understanding of the history of the Bible. Few Protestants know that the book, which they claim is the sole and definitive source of truth, actually came from the Catholic Church. The words are from God, but the book that contains the Word is courtesy of the Catholic Church. If people know this they might begin to see the folly of Sola Scriptura (the Bible alone)Protestantism. How can you believe in the tradition of “Bible Alone”, when the Bible you revere, was compiled, protected and published by none other than the Catholic Church for centuries before that tradition was taught? How can you believe in the tradition of “Bible Alone”, when the tradition is not found anywhere in the Bible? Why would you hold to the tradition of “Bible Alone” when you know that the tradition was developed by people who removed books from the Bible and have taught that it was the Catholic Church who added books to the Bible? Pope Benedict emphasized the importance of reading Scripture “in the Tradition of the Church.” The inseparable relationship between Tradition (the word of God revealed to the living community of the Church) and Scripture remains as perhaps the single most misunderstood element of the true Christian religion among those who trace the origin of their particular faith tradition to the Reformation. Simply, Tradition is viewed today by some Christians as an intrusion on the word of God, when, in fact, it is just the opposite: it is essential to a fruitful and proper understanding of Scripture. One without the other diminishes the whole of God’s revealed word. The notion that Scripture should be interpreted in an isolated fashion apart from Tradition was foreign to the apostolic Church, as St. Paul attests: “Therefore, brothers, stand firm and hold fast to the traditions that you were taught, either by an oral statement or by a letter of ours” (2 Thess. 2:15). It was not until Martin Luther and the Reformation in the sixteenth century that sola scriptura became entrenched in parts of Christendom. The task is to determine what constitutes authentic tradition. How can we know which traditions are apostolic and which are merely human? The answer is the same as how we know which scriptures are apostolic and which are merely human—by listening to the magisterium or teaching authority of Christ’s Church. Without the Catholic Church’s teaching authority, we would not know with certainty which purported books of Scripture are authentic. If the Church revealed to us the canon of Scripture, it can also reveal to us the “canon of Tradition” by establishing which traditions have been passed down from the apostles. After all, Christ promised that the gates of hell would not prevail against the Church (Matt. 16:18) and the New Testament itself declares the Church to be “the pillar and foundation of the truth” (1 Tim. 3:15).